In this article I review one that I have found. This product I am reviewing here is an audio product that I’ve used almost every day since I discovered it several years ago – a binaural beats mp3 for extra-sensory perception. Unlike most products and courses, this is a product that you only need listen to, in order to feel the effects on your intuitive abilities, as “too good to be true” as that may sound! In this article, I’m, going to talk about how exactly binaural beats have amplified and improved my intuitive abilities in the last few months, so that you can decide whether they could help you too in your intuitive development. Binaural beats are rhythmic humming sounds that are created by playing two simple tones in the right and left ears. They are sold online as mp3’s. They don’t just include humming. In order to make them nicer to listen to, they also have water and nature sounds on them, plus some music. And you have to listen to them using headphones. These beats have been proven to alter brainwave frequencies, resulting in an altered state of consciousness. This state of consciousness is called the alpha state. What is the Alpha State? For certain states of consciousness and activities, certain brain waves occur. Alpha is the brain wave that occurs during light sleep, dreams, meditation, daydreams and creative visualization. It’s the state you need to be in, in order to receive intuitive information. Being in the Alpha State is like being in a light trance – you notice what is going on around you, but your usually busy mind is extremely quiet. You become a clear conduit for intuitive information. If you’ve had a reading with an intuitive on the phone or in person, they will have been in this alpha state while talking to you. The thing is, we all have intuitive guidance available to us, when we can quiet our minds and put ourselves in the alpha state. But most people don’t know they need to be in the alpha state to receive it. And most people certainly don’t know how to put themselves in the alpha state at will. And so we may only get glimpses of intuition here and there, and our intuitive skills seem to work sometimes, but not at other times. That is because we spend most of our waking time in a state that is not conducive to receiving intuitive information – the beta state. Beta is the brain wave that occurs when you are fully conscious and awake. You are concentrating and your brain is engaged and busy, busy, busy in this state. You cannot receive intuitive information in this state, although you may have already tried and failed. So, quite simply, unless you can quieten your mind and put yourself into the Alpha state, you don’t receive intuitive information when you want it. I used to think that intuitives were born gifted, or special. But now I know that they are just people who have learned to put themselves into this altered state of consciousness at will and have done some experimenting with processes while in the alpha state. I know that, because I am one of them. This Extra-Sensory Perception mp3 guarantees to put you in a peaceful meditative state, sometimes within just 5 minutes of listening to it. And you can even let your mind wander while listening – you don’t need to try to quieten your mind, because the mp3 does it for you automatically. And if you listen to it regularly, it trains your brainwaves to be able to enter that state quickly and easily in future. It effectively fast-tracks your intuitive development. Another way to fast-track your intuitive development is to learn to meditate. If you can do it regularly and consistently, it will put you in the alpha state too. That is why meditation is frequently recommended for intuitive development – and rightly so. But the thing is, I never really got that far with meditation. Meditation is one of my least favourite things to do. And I know a lot of people who feel the same about it. I had real trouble quietening my thoughts for ten seconds, let alone a whole minute. My mind would bang on about anything – how I was hungry, thirsty, too hot, too cold, wondered about what I would have for dinner, remarked on how loud the road works are. I am someone who needs to be moving. I have a lot of nervous energy. Meditation was like torture to me. I did the absolute minimum meditation before readings – just enough to enter the alpha state. I didn’t know how much my undisciplined mind was holding me back in my intuitive development until I started using this mp3, which I discovered by accident. I first discovered them, via my friend and hypnotherapist Angela who sent me a hypnosis mp3 to help me sleep. Firstly, she sent a hypnosis mp3 with her simply talking. I listened to it a few times but it was just like my meditations – it was hard to get my mind to shut up and pay attention. So, I wasn’t sure I was being hypnotized. Then a few days later, she sent me an updated version of the hypnosis – an mp3 to help me to sleep with some binaural beats on it. When I listened to this mp3, I noticed the difference straight away. It was like it was speaking to a whole different part of me – that was present, and listening. I was hypnotized. While listening, I realized that I was in the same state that I’m in when I do readings, and it had happened within a matter of minutes. And I didn’t have to meditate to get there – hurray! So, I was not surprised when I found out that binaural beats don’t just help you to sleep, they are also used to awaken and improve extra-sensory perception and intuition. I ordered one of these specialized ESP MP3’s from the Unexplainable Store to check it out. I spontaneously had vivid meetings with my Spirit Guides – without even trying. My chakras opened up spontaneously and I felt tingling in various places on my body. Any stressful thoughts and anxiety drifted away and my thoughts, in general, were silenced. While listening, I spontaneously received a variety of intuitive insights and epiphanies about my life. Those are just a few of the general experiences I have had. This sort of thing happens every time I listen. It’s not hit and miss. My students report similar results and I have read that these experiences are par for the course while listening to the mp3. I like inducing experiences like these on a daily basis – It makes me feel more connected to my guides and spirit. I also believe that my readings have improved as a result of listening to binaural beats. Whereas before it would take me a long time to calm my mind before a reading, now I can do it quickly and it’s not difficult for me anymore. That might sound strange but it is very enjoyable. It’s so far from the chore that meditation was. I mentioned binaural beats on my blog a few weeks ago, and since then, several readers and clients have told me that they also use binaural beats for anxiety and stress relief (I can vouch for that as I always emerge from a binaural beats session feeling lighter and in a better mood). I also know people who use them to help them have lucid dreams. Are Binaural Beats Right for You? You are interested in awakening your intuitive abilities. You want to strengthen your already existing intuitive abilities. You want to learn to meditate but find it hard to relax or quieten your mind. You do intuitive readings but find that your mind can sometimes get in the way of connecting with people’s Spirit Guides. Please note that this ESP binaural beats MP3 is not right for you if you are looking for a quick magic bullet for awakening intuitive abilities, permanently. Nothing will do that for you. You will have to do other work too. The ESP binaural beats mp3 will definitely train you to be in the alpha state, which is an essential component of receiving intuitive information. But remember that that is one essential part of awakening intuitive ability – it’s not the whole process. Effective intuitive development = the alpha state + finding the right process for you, and practising it too. The mp3 that I have used and recommend was from the Unexplainable Store. It cost $14 (US dollars) and they have a 60-day money-back guarantee in case you don’t like it. These recordings are also better sound quality than many of the other binaural beats that I know of which are sold online. You can order the MP3 that I tried here – Extra-Sensory Perception Binaural Beats MP3. If you buy the mp3, I hope you enjoy listening to them like I have. Disclosure: This blog contains affiliate links, which means that I will receive a small commission if you choose to purchase. This does not affect how much you pay. I only partner with websites and tools that I use myself on a daily or weekly basis and which provide real value to me and my students. All really interesting, thank you! And very timely, too. Just one question. I want to develop my clairaudient skills for shamanic journeying which I am a complete beginner at, so would you suggest I get ‘shaman consciousness’ or ‘ESP/Psychic’? Is there any difference between the two states? I’ve been meditating (in silence) for a couple of years without particularly spectacular results but have had a spontaneous clairaudient experience in a relaxed state which made me think I should develop that clair first. Thanks again! Just bought it! I’m wondering, should I listen to it while connecting to spirit guides etc, or before, or just regularly, or…? Thanks, Rose. Hi Rachel, To be honest I’m not sure what the difference is between the two, as I’ve not tried shaman consciousness. I daresay they have a similar goal – to open your perceptions. So I say either would be good for you. But listen to your gut to help you choose- which one appeals to you more? Hi Rose! I listen to the recording regularly for 30 minutes and I find it helps overall. But you could listen to it during or before as well – you might want to experiment to see what works best for you. 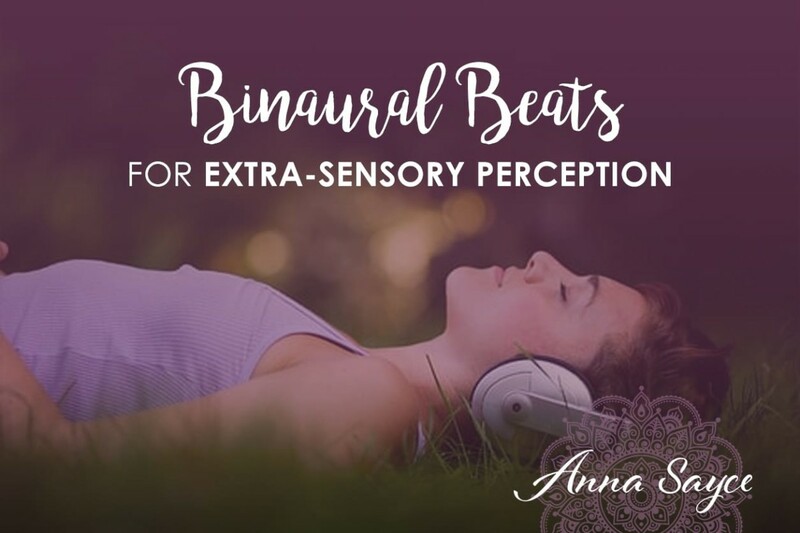 Thanks Anna – the ESP Binaural Beats are great!! I listen whenever I get the chance (most often when I’m on-the-go as opposed to sitting for a quiet session.) I’ve noticed a definite increase in synchronicity and my overall clarity, as well as that I am dreaming much more often. I try not to let a day go by without listening for at least a few minutes, they are *that* powerful. Great article Anna. I recently downloaded an iApp called BrainWave Deep Relaxation which uses Binaural Beats. And I gotta say, I was completely skeptical about it. I already meditate regularly, usually half an hour a day, and LOVE it. It is such a magical process. But I’ve also found, for just chilling and listening to “music”, the BrainWave Apps was very effective, quickly dropping me down into the same state that meditation does. ps. don’t give up on meditation! It’s not about quieting the mind. it’s about just observing what is there in the first place and as a result of this continued observation, combined with breath observation, the mind quiets itself. In essence, the quiet mind is a byproduct of the process, not the process itself. It’s impossible to force the mind to do anything! Thanks Anna! just seeing the list of what was available for listening to brought floods of memories back to me that were so useful remembering my last period of psychic development (!) Astonishing how easily we can forget when we move from place to place and to crowded, urban areas. I was looking for a reputable place to get these with no scams and a wide selection. The site owner’s explanations are thorough. I’ve been listening to Binaural Beats for a few months now, and can attest to their effectiveness. I find it much easier to get into a meditative state. They help you tune into the state more, so that when you try to reach the state later on without the aid of the Binaural beats, you already know what it feels like. Hi Anna, I went to the store site to purchase the Mp3 and they say Isochronic Tones is the top of the line so to speak — is it best to get the binaural or the Isochronic? I’m excited to hear there is way to quiet the mind – I can’t seem to get there and remain so a tool is much appreciated! I haven’t tried the isochronic although I have heard some good things about them. I just love the ESP binaural beats one which is why I wrote a review of it, so can 100% recommend that. but can’t “officially” recommend the isochronic as I haven’t tried it. But I do know they have a 60 day money back guarantee so I guess you could try the isochronic and then if you don’t like it, ask for a refund. I just bought it and listened to it and I must say…WOW. While listening to it I saw an “eye” in my mind’s eye…could that be my own third eye or my guides? I also felt cold all over (every time I connect with Spirit I do) and then felt warmth all over. It was very peaceful and I definitely enjoyed it. Thanks so much! Well, I went to their site and signed up for their newsletter. They sent me two mp3 short versions of one of their products as a free try. I have meditated with the bianaural beats three times. The second time I did it I felt my hand chakras on fire. I’m a healer and I do hands on healing. The third time I used it, I used your empath centering meditation along with it. This time I felt a heat wave on my third. Immediately, I started seeing very vibrant neon colors. I was then taken into a journey with my higher self…who gave me a special healing message. Thus, even with just 10 minutes I’ve had these two great experiences. Can’t wait to try more of their products. Thanks for reviewing your experiences for us! If it hadn’t for the article I would have not gone back to the site. Hi Kat, glad you have been enjoying the binaurals! Welcome to the blog. Have you tried Brain Sync binaural beats before? No I haven’t, so I can’t comment on those. Have only used the ESP binaural beats. Hi Anna, how often should i listen to the binaural beats mp3? As often as you like really – I used them once a day when I first started listening to them. Excellent! I just made the purchase. I have been looking for a good binural beats mp3. Thanks for the link. I’m so, So, SOOO skeptical of stuff like this. However, after reading through your entire site, realizing that you truly are “the real deal”, I clicked on the link and bought the binaural beats you suggested. I just got done listening and all I can say is, “Wow!” I have no idea if my brain waves were being affected or not, but I FELT SO GOOD just listening. It was the same feeling I get when I listen to my favorite songs on my IPOD. Wow… These beats completely exceeded my expectations. Thanks! Glad you enjoyed the binaural beats. They’re great aren’t they! I still listen to mine regularly after all this time. I use binaural beats when I am drawing or painting… they help me to be more visually sensitive. I do portraits from photos. I have read articles that state epileptics should not listen to Binaral beats as it alters the brain wave patterns, which can be bad for epileptics (such as me). Is there anything else you may recommend to assist getting into the alpha state? I’m wondering why the Binaural beats and not the Isochronic ones? I always heard the Isochronic ones are more effective? And I think it says that somewhere on their website too. Thanks. I’m not able to recommend the Isochronic ones ‘officially’ because I haven’t tried them. I’ve only tried the binaural beats. The Isochronic ones do appear to be popular though, that must be for a reason. My next question for you would be: I have a very hard time meditating. I get sleepy, itchy, and can’t get my mind to shutup for dear life. I noticed on the Unexplainable Store that they have beats/tones under “Meditation”. Now I see here in this article you recommend the “ESP” Binaural Beats to reach a Alpha state.. but what do you think about the “Meditation – Brainwave Entrainment Alpha” Binaural Beats/or Iso. Tones? Something tells me that would focus on the goal directly, though I’m wondering if both would do the same thing. And if so does that mean that ANY of the spiritual beats & tones will take to you a Alpha state if you listen to them consistently? – Thanks! I just bought the binaural beats but then realised that I am approx. 80% deaf in one ear. Do you still think that they would work? Thanks. Apologies – I only just saw your question. You could always try them and if they don’t work for you, request a refund. I stumbled across binaural music recently while searching for a meditation to release my fear I have with spiritual awakening I am now experiencing. It was amazing, I felt so relaxed and the fear dissolved so much that I had the courage to try meet one of my spirit guides. I was in complete control at all times but able to see stuff my fear had been preventing me from seeing. I now listen to it every day. I am yet to see anything more but I now feel encouraged that I don’t have to only meditate in order to develop my ability. On this page – http://www.unexplainablestore.com/products/esp.php what’s the difference between the binaural beats that’s advertised for $10 and the ones below that are advertised for $34. Please let me know as I’m not sure which to purchase to try out. It looks like the $34 one is a package that includes the ESP binaural beats (which is the one I personally use) and 2 others, which I have not tried. Thank you for the article. I cannot say enough about something so simple, yet addictive, because you actually see instant results. I’ve never seen anything in my life produce instant results like binaural beats and brain waves.